Businesses have been urged to tap into Scotland’s wildlife tourism market after figures indicated the country attracted more than a million wildlife trips a year. The call came in a new guide published by Tourism Intelligence Scotland (TIS). Wildlife tourism is already estimated to generate £276m a year for the Scottish economy. Ministers said the figure should rise further because of growing interest in sustainability and responsible tourism. The new guide offers advice on how businesses can help wildlife enthusiasts make the most of their trips in Scotland. It encourages accommodation providers to offer guests access to maps, keep spare binoculars and waterproofs for guests to use, and place information about local wildlife, nature reserves and trails on their websites. The Wildlife Tourism in Scotland guide has been produced in partnership with Scottish Natural Heritage, Forestry Commission Scotland and Wild Scotland. 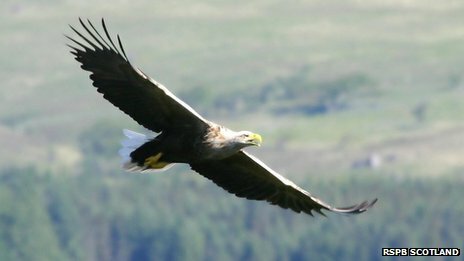 “Scotland has an abundant range of rich and unique wildlife and habitats – from ospreys to otters, and forests to farmland. “We also have some of the most fantastic, world-class settings in which to enjoy wildlife.